I was doing some cleaning-up at home when I saw my diary. I kept a diary when I was just a little girl of eleven. It was kinda funny reading what you wrote 18 years ago. I was also seeing myself when I was at that age. About my life involvement - all about school and friends. Peer pressure. Homework. Exams. I also see myself grow. My english improved. My writings became more structured and with depth. My ability to better express my emotions in words. I also realized that as I grow, most of my entries became more and more sad. It seems like I only write in my diary when something bad happens or whenever I am sad. My diary provides a place for me to pour my heart into. It's no wonder that I am so addicted to blogging now. 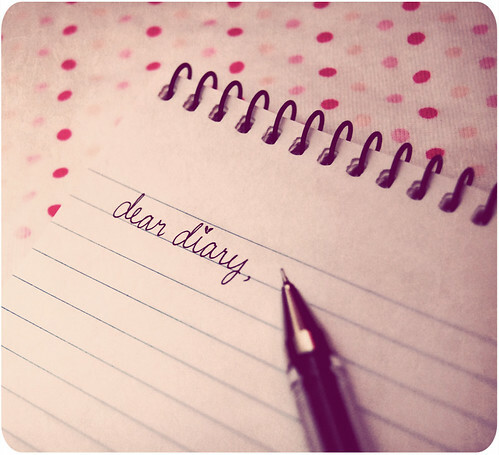 My diary was my sanctuary and now my blog is my sanctuary. I am just glad that I am blogging more about happy things nowadays. Life can be pretty simple if you just let it be. Live well be happy. Smile and be happy.